MHS sophomore Hannah Durst (11) attempts a spike during the Lady Marauders setback against Alexander on Tuesday night in Rocksprings, Ohio. ROCKSPRINGS, Ohio — A tough night for the Lady Marauders. The Lady Marauders volleyball team suffered a three games to none setback to Tri-Valley Conference Ohio Division foe Alexander on Tuesday night in Meigs County. In the opening game, the Maroon and Gold (2-4, 0-3 TVC Ohio) trailed 7-0 early in the contest as the Lady Spartans (6-1, 3-0) utilized an 18-12 scoring run en route to a 25-12 victory. The second game was tightly contested as Meigs jumped to a 10-7 early in the contest, but the Red and Black manufactured a 9-6 scoring run to tie the game at 16-all. From there, the Lady Spartans outscored the Lady Marauders 9-3 to earn a 25-19 victory. Following a seven-all tie in the third game, Alexander never surrendered the lead again and rolled to a 25-17 win while earning a 3-0 match victory. The Lady Marauders service attack was led by Kylee Mitch with seven points, while Mallory Hawley followed with six points. Maddie Fields posted four points, while Breanna Zirkle was next with three points. Rounding out the MHS service attack was Baylee Tracy with one point. 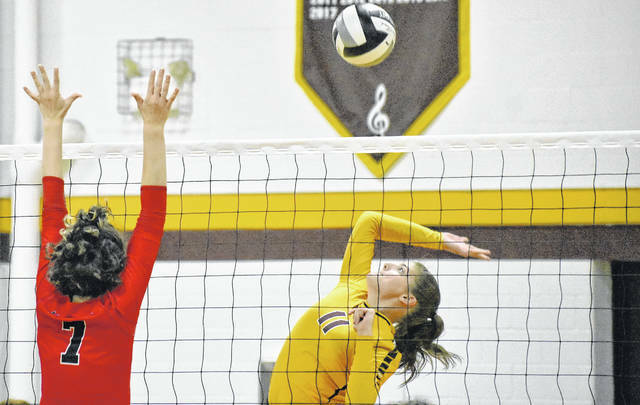 As a team Meigs finished with 16 kills, three aces, seven blocks and 53 digs. Marissa Noble and and Maci Hood led the Lady Marauders at the net with five kills apiece, respectively, while Hawley was next with three. Hannah Durst had two kills, while Tracy finished with one. The Maroon and Gold will have a chance to avenge this setback on Sept. 27 in Albany. After visiting Logan on Wednesday, Meigs will resume league play on Thursday at Athens.